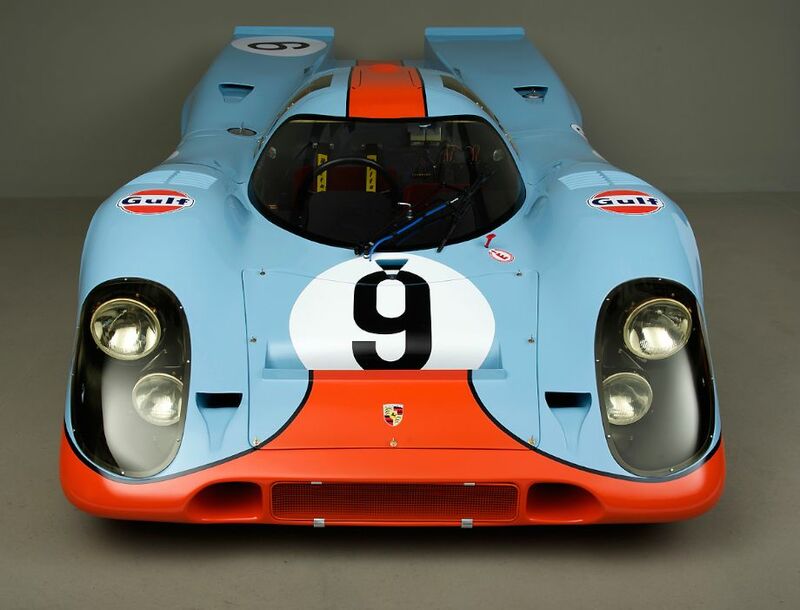 A 1969 Gulf Porsche 917, chassis 017/004, will be shown at several events during the 2014 Monterey Classic Car Week. This special Porsche 917 will be shown at the Carmel Concours on the Avenue on Tuesday, August 12, McCall Motorworks Revival on Wednesday, August 13th and in the Porsche Pavilion at Mazda Raceway Laguna Seca from Thursday, August 14th through Sunday, August 17th. A special era in the history of the Porsche 917 stems from a private conversation held between Porsche team manager Rico Steinemann and the legendary John Wyer the night before the running of the 12 Hours of Sebring in 1969. Steinemann had been authorized by Porsche management to offer J.W. Automotive Engineering the Porsche factory racing program for 1970 and 1971. Now there were several reasons behind the invitation, foremost was the ability of the Slough based U.K. team to consistently win against newer cars backed by better funded teams. Case in point being that the Gulf Oil backed J.W.A.E. outfit was using what many considered an obsolete car in their Ford GT40 against current competition, and beating them. Wyer replied that he would take the matter up with Gulf Oil who were more circumspect as to what could be gained by joining Porsche. When the 917 was shown at the Geneva Salon a week earlier John Wyer had clearly seen the future of sports car racing. In Wyer’s own words, “Porsche had, typically, done it first, and at a stroke every other car was out of date.” In addition, he pointed out, in the direct Wyer manner, that he could offer no prospect that would be able to beat it. All of this took place in April of 1969, and while there was a basic agreement and understanding between Wyer and Porsche, there was still a full season of racing ahead. The high points for both organizations were J.W.A.E. once again claiming the 24 Hours of Le Mans with their “obsolete “ Gulf GT40, and Porsche winning the World Championship of Makes using a combination of 908s and early model 917s. The final contracts were signed in August. The agreement called for Porsche to supply J.W.A.E. with seven complete 917s over the 1970 season. The first of those was chassis 917-004. A proforma invoice dated December 5, 1969 confirms this, with actual delivery to Slough three days later. 917-009 was to later join 004 in January, while 013, 014 and 015 were prepared and collected from Porsche for shipping to Daytona. Chassis 917-016 was shipped to J.W.A.E. in March of 1970 with chassis 017 being held in reserve at Zuffenhausen with the possibility of being built up as a new car for Le Mans. 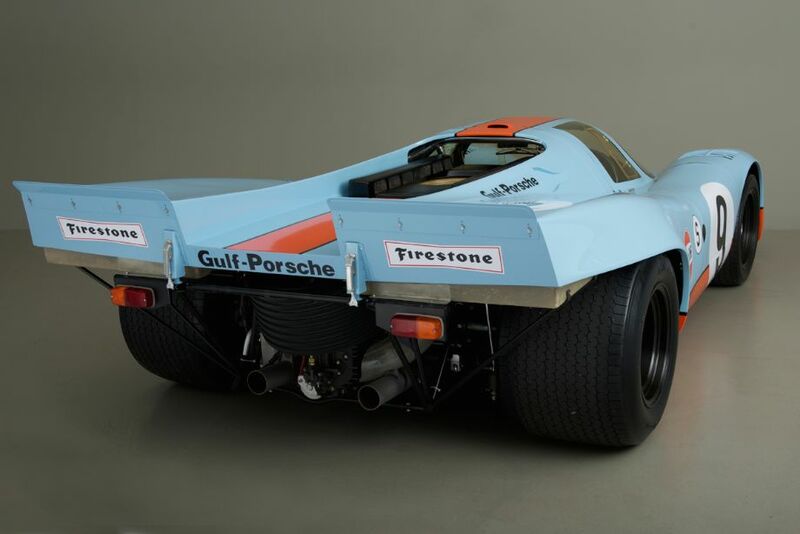 If a Gulf-liveried Porsche 917 does not get your blood flowing, then nothing will. Serious preparation on 917-004 and 917-016 was well underway at Slough in March, with the upcoming 1000KM race at Brands Hatch to be held on April 12th. A letter from J.W.A.E., received at Porsche on April 2, 1970, requested a number of new parts to bring 004 up to date, which were promptly shipped out to Slough in time for the car to be ready to race. The BOAC 1000KM race at Brands Hatch featured the best of competitors, along with some of the worst of English weather in the form of wind and rain. Qualifying for 004 and 016 showed mixed results, but all that changed for the actual race. The driver pairings were Pedro Rodriguez and Leo Kinnunen in 016, and the great Jo Siffert and Brian Redman aboard 004. Both 917s started on narrower wheels with Firestone rain tires. Rodriguez had a phenomenal race in the heavy English rain, and 016 went on to the overall victory. 004 had a troublesome start with Siffert suffering a flat left rear on the circuit and losing valuable time attempting to get back to the pits. He rejoined in third place and according to J.W.A.E. chief engineer, John Horsman, “the car had been alternating between second and third place and ready to win if Pedro faltered.” However it all came to an end on lap 177. Brian Redman was at the wheel of 004 when he was hit from behind by Chris Amon’s Ferrari 512S, effectively ending his race. Upon returning to the J.W.A.E. workshops after the race, it was determined that although the damage to the chassis of 004 was not significant, due to the upcoming race schedule it would be advantageous to return the damaged chassis to Porsche and replace 004 with 017. This replacement chassis was picked up by J.W.A.E. from Zuffenhausen on April 26, 1970 and delivered to the workshops at Slough for immediate assembly. In order to maintain the validity of the carnet that had been issued for 917-004, the chassis tag from the damaged chassis was removed and welded in place on the new chassis of 017, thus 004 would continue in service. The damaged 004, now with the identity of 017 for paperwork purposes only, was returned to Porsche and eventually repaired later that fall and put in storage. 1969 Porsche 917, chassis 017/004, one of four 917s to be found at Canepa Collection in Scotts Valley, CA. In 1975, the chassis known internally as 017/004, was sold to Alan Hamilton of Hamiltons of Australia, the official importer of Porsche vehicles for the land down under. The man was not only a racer but also a collector of Porsche race cars, having owned several 908s, and having purchased 917/30 chassis 004 directly from the factory. The purchase of an original 917K was almost an afterthought. Eventually Hamilton sold the chassis to a racing friend, Pat Burke, who by using the usual sources located and purchased many of the parts needed for assembly. In 1989, after years of being in various states of partial assembly, 017/004 found its way to David Piper. 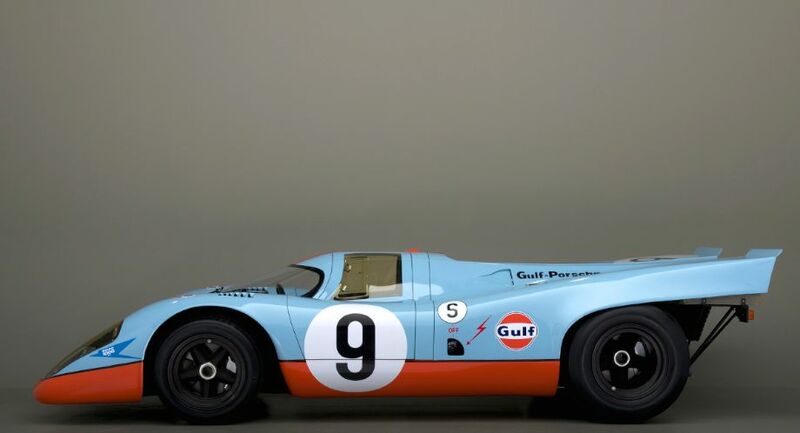 Piper, who had amassed a sizeable amount of spare parts for the 917, completed the car in Gulf colors and added the short vertical fin tail section from 1971. He would be very familiar with the car, since he raced 004 in 1969 at its first race, the Nurburgring 1000KM. Piper and co-driver Frank Gardner took 8th place, and thanks to this finish 004 is considered to be the first 917 to finish a race in its entirety. In 2004, the completed and running car was being offered by Fiskens of Kensington, and a deal was made by principal Gregor Fisken with Stephane Ratel of the SRO Motorsports Group. Ratel has impeccable credentials having been one of the founders of the BPR Series, which later became the FIA GT Championship. Ratel had his friend and former partner in the BPR, Jurgen Barth, visit Fiskens and inspect 017/004 prior to purchase. Ratel had planned to run the 917 in historic events but simply did not have the time to participate, and the car then found its way to Miguel Amaral of Portugal. Amaral had his own impressive stable of current and vintage race cars, and raced 017/004 on the great circuits of Europe on numerous occasions. Lightweight construction utilizing aluminum tubing and thin fiberglass. 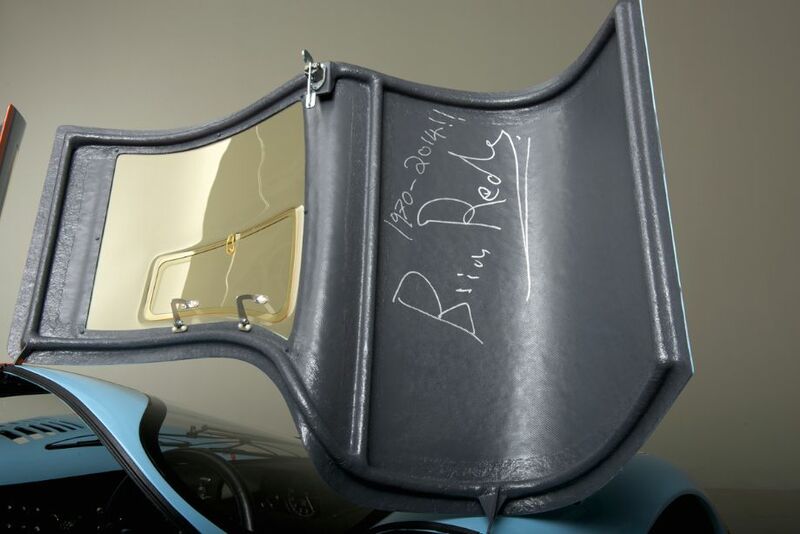 Brian Redman’s signature adorns the driver’s door. Those two fiberglass trays are luggage compartments. Between them is the very first ‘Space Saver’ spare tire. In 2008, Amaral decided to send the car to California for restoration under the guidance of noted Porsche historian Kerry Morse. The car was delivered to Porsche Motorsport North America for disassembly of the drivetrain and electrics. Unfortunately the project suffered a series of delays and setbacks, not an unusual occurrence with a difficult, high-end restoration involving the manufacture of vintage components. In 2011, at Rennsport IV, the subject of 017/004 came up between Kerry Morse and Bruce Canepa. Having pursued this specific 917 in the past, and still interested in purchasing it, Canepa and Morse worked out a deal. In December of 2011 all of the components of 017/004 were delivered to the Canepa facility in Scotts Valley, California and a full inventory of the parts was undertaken. 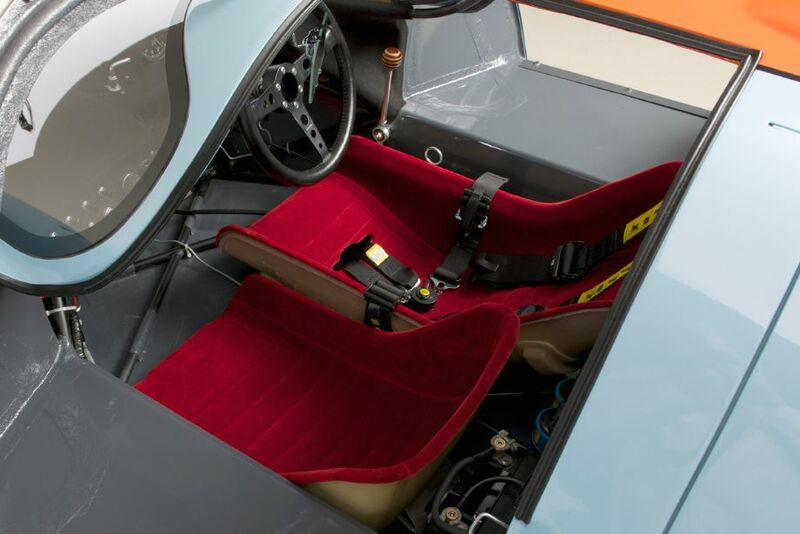 Canepa’s goal was to restore the car to its Gulf liveried, Brands Hatch configuration. Once the scope of the project was fully understood it was decided to bring together a team of the finest experts to complete the car. Normally all the work would have been executed in-house at Canepa, but with a dozen high level restorations already underway, including another 917, Bruce decided to send the body and chassis of 017/004 to Kevin Jeannette of Gunnar Racing in West Palm Beach, Florida. Gunnar, like Canepa, is well-known for their extensive and thorough restorations of Porsche competition vehicles. Having owned and raced one of Gunnar’s 917 restorations Bruce knew that they had the experience, expertise and quality that would meet his standards for a world-class restoration. While the craftsmen at Gunnar began the two-year process of completely restoring every aspect of the 917 body and chassis, the Canepa team engaged Ed Pink Racing Engines in Van Nuys, California to rebuild the legendary powerplant. Under the careful guidance of general manager, Frank Honsowetz, the 4.5-liter flat twelve cylinder was rebuilt and increased to 5.0 liters, the most potent of 917K engine specifications. A new crankshaft had to be manufactured to accomplish the build, and Canepa gave this task to the craftsmen at Crosthwaite and Gardner in the England who are renowned for their precision machine work on vintage race cars. Finally having sourced a new set of 5.0 Mahle pistons and cylinders the intricate engine build was complete. The rare Type 920 four-speed gearbox was entrusted to Dieter Inzenhofer of Andial fame for a complete rebuild. The Canepa project team spent long hours making sure all the elements going into 017/004 were absolutely correct. Working with a cadre of specialty parts suppliers, and using up plenty of favors, part-by-part the 917 came together. For example the headlights, NOS and still in their Porsche boxes, came from Kevin Jeanette’s personal parts stash. Kerry Morse assisted the build, contributing his vast knowledge, and access to his sizable period parts collection. 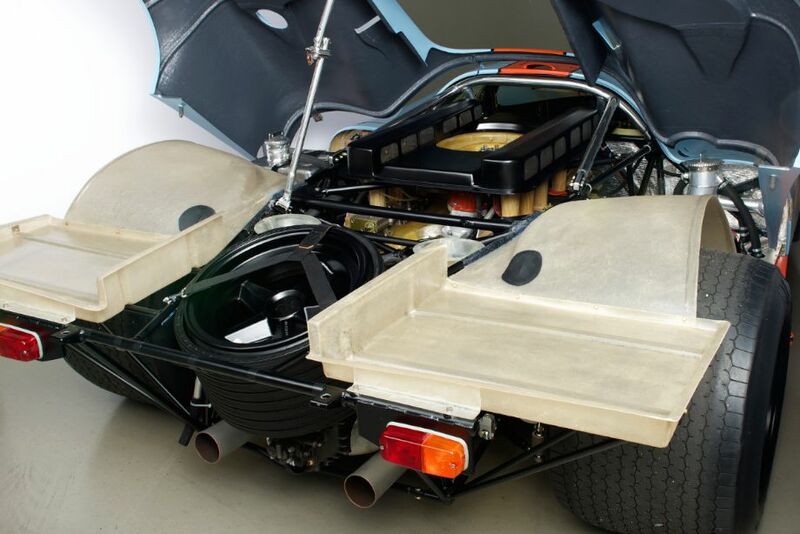 From the smallest bolt, to the intricate aluminum chassis, every element of the 917 was scrutinized and vetted. The goal was to create the most accurate restoration of a 917 to date, and thanks to the hard work of multiple teams of experts that goal has been accomplished. This particular chassis, while not having the extensive race results of some of the other examples, occupies a special place in Porsche history. 004 began life as one of the original cars for homologation in April of 1969. It is one of the few examples to be raced in 1969, and is considered the first 917 to go the distance and finish a race in its entirety. However, it comes down to the fact that 004 was, and is, a legitimate J.W. Automotive Engineering 917K. 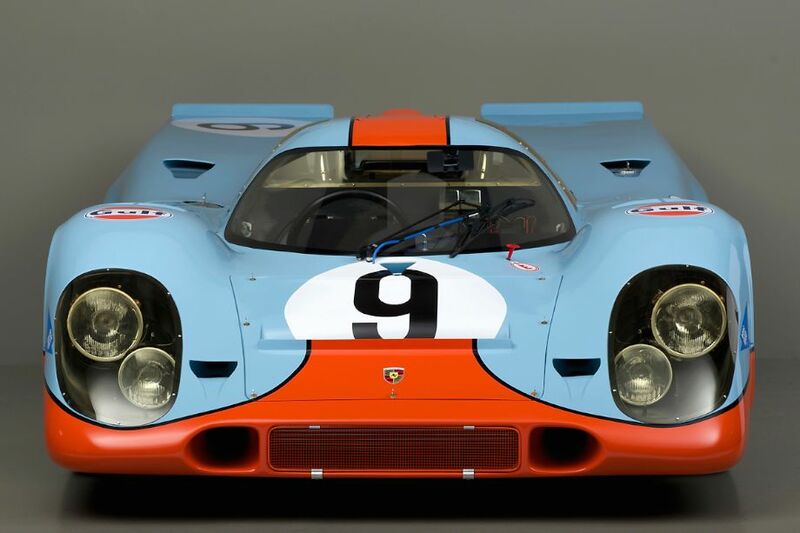 917s are rare beasts, and it is even rarer for one to come up for sale, especially one that can irrefutably wear the soul-stirring Gulf colors of blue and orange. Another view of 1969 Porsche 917, chassis 017/004. Look closely and you can make out the ‘Space Saver’ spare tire and the twin luggage compartments. June – Nurburgring 1000KM, Drivers: Frank Gardner and David Piper, Result 8th overall. This was the second race for a 917, however, as the first race for the new car was at Spa where the car had mechanical failure on the first lap, 004 is considered the first 917 to go the distance and finish a race in its entirety. April – Original chassis 917-004 returned to Porsche to be repaired and renumbered as chassis 017. Bruce Canepa and his teams are absolutely amazing. He’s done more to preserve the history of motor racing than almost anyone I know. His collection is second to none. Thank you Bruce! Kevin Jeannette is amazing, he has restored cars that are now in the Porsche Museum. His team at Gunnar Racing did an amazing job making 917-017 the most perfect, complete 917 on the planet. I was at the B.O.A.C. That year , and watching the three Ferrari nose to tail 1,2 & third in the rain was awesome . 908/02 and then the first 512S Amon/Merzario/Ickx in 5th. Other 512s listed in 8th and 14th. Not exactly a 1,2,3 finish for the 512s. Beautiful photography of a beautiful car.